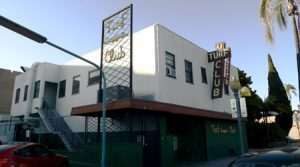 Back in 1950 cocktails began pouring inside a nondescript 2-story building near the corner of 25th & C Streets in the heart of Golden Hill; Turf Club was its name. A few years later in 1955 a gas line was plumbed into the dining room where a new grill had been installed for the use of patrons to cook their meat the way they wanted it … and so the following year the name settled on Turf Supper Club. With only a few minor changes that original model remains the same to this day. Oh sure you can talk about changes to the color of the paint, the presence or absence of a self-service salad bar, or the size and type of jukebox in the house … but the tangible things that make Turf Supper Club what it is, are the same today as they were decades ago; a long bar with plenty of stools, a piano to entertain, red lights and carpet, photos of horse races and movie stars from days of yore, antique neon marquis lights … and that classic wallpaper. Today we focus on providing our friends and patrons with an opportunity to escape from life’s stresses by entering into a friendly environment that features classic cocktails, cold brews, quality meats, great music, old movies and some of the best people watching anywhere. And if for some reason grilling food isn’t your thing, then take a seat at the bar and enjoy us for what we are at our core … one of San Diego’s oldest cocktail lounges.